They are usually sold cleaned with the tentacles stuffed into the bodies, but to save time, you can buy ready-sliced calamari - 300-400g will be enough for four. Keep the tentacles as well as the bodies. Even if you have bought ready-cleaned squid, rinse the bodies inside and out, making sure any sand or gloopy bits are washed away. Trim the tentacles of any extraneous squid matter, and rinse these too. Preheat the oil in a deep pan or deep-fat fryer to 180°C, or until a cube of bread turns golden in 30 seconds. Meanwhile, slice the squid bodies into thick rounds. Thoroughly dry all the prepared squid, including the tentacles, by layering it in kitchen paper. If it is not sufficiently dry, too much flour will adhere to it and it is more liable to spit in the hot fat. Put the flour in a large mixing bowl and season with salt and freshly ground black pepper. 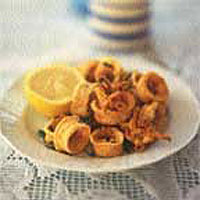 Mix in one-third of the squid, then shake off the excess flour before adding to the hot oil. Fry for about 3 minutes or until golden, then repeat the process with the remaining squid. Serve immediately with the lemon halves and, if you wish, some chopped parsley.